Responding to Apple’s retail lead, the South Korea based maker of Galaxy smartphones and tablets has made a major move in partnership with Best Buy, which also sells Apple products. Samsung is calling it the final component in a three-legged approach to competing with Apple in the United States. Beginning Monday, April 8, the South Korean smartphone maker will open hundreds of so-called Samsung Experience Shops in Best Buy stores across the country. “This is the last of a three-legged stool, from products to marketing and now retail,” Ketrina Dunagan, retail marketing vice president for Samsung Mobile in the United States, told Bloomberg. Although Samsung is the world-leading smartphone company, it trails Apple in the US. 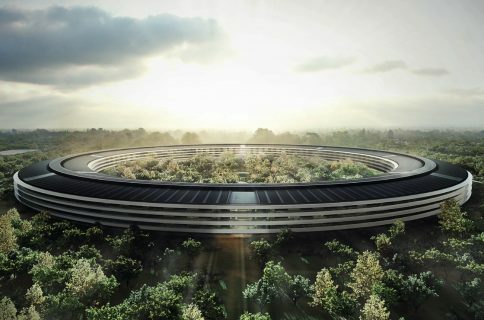 The iPhone maker had 38 percent of domestic smartphone sales, versus 21 percent for Samsung, according to a Mar. 8 report by ComScore. According to a media release, the first 500 mini stores are just 460 square feet inside the usual 40,000 square feet of Best Buy locations. 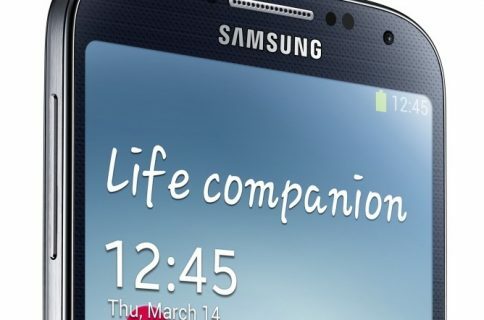 Looking at the big picture, the announcement marks a change for Samsung’s promotional efforts. “This is our first opportunity to demonstrate connected mobile products in a location with educated Samsung employees able to walk consumers through the experience,” adds Dunagan. 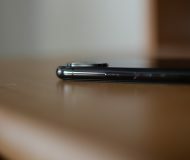 In 2012, the company shuttered a showroom at Columbus Circle in New York, which demonstrated Samsung products, but provided no local sales plan. With the Best Buy deal, Samsung offers tech-saavy demonstrators and products nearby for purchase. Select Best Buy stores will have Samsung Smart Service, which includes dedicated Samsung Experience Consultants and Best Buy blue shirt sales associates to assist customers with purchasing and activating mobile products on the carrier of their choice, understanding their device and supporting them throughout the lifecycle of their product. The specially trained Samsung Experience Consultants will assist with product demonstrations, basic product services, Samsung account set up, warranty registration and post purchase support. More about Samsung Experience Shops is available via a dedicated Best Buy page. 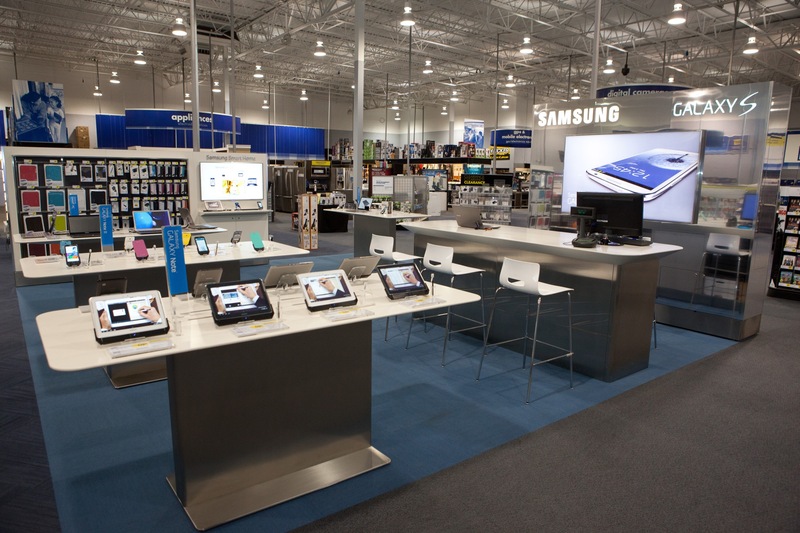 Here’s a press video showing off Samsung’s store-within-a-store at Best Buy. What’s more, the majority of American consumers are close to a Best Buy store, Samsung claims. Although the majority of Samsung’s planned mini shops in either Best Buy or Best Buy Mobile stores will be smaller than the initial locations announced today, the news could put the smartphone maker in striking distance of Apple’s retail presence. More than 120 million visitors toured Apple’s dedicated stores in December. 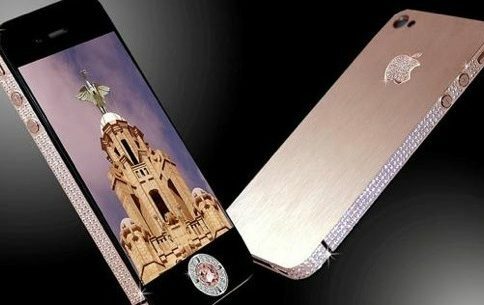 The locations have been likened to Tiffany for Apple’s ability to squeeze the most revenue per square foot. In January, Apple announced its stores brought in more than $6.4 billion. Apple says it has another 740 kiosks or sections in Best Buy stores.